What is this? When I read a book, I write summaries as I go. I started in July 2010 so the collection is small. Seneca the Younger (5 BC - 65 AD) was a Roman Stoic philosopher and tutor, then advisor, to the emperor Nero. He was ordered to commit suicide after being implicated in a famous plot to kill Nero, though it is believed Seneca was innocent. On the Shortness of Life (originally titled De Brevitate Vitæ in Latin) was written in 49 AD. This book is part of Penguin’s “Great Ideas” series of books where a number of essays are taken from a single author and presented in a small, single book. The presentation, and especially the cover, is great - simple, cheap books. The book contains three of Seneca’s essays: On the Shortness of Life, Consolation to Helvia, and On Tranquility of Mind. I have skipped the latter two as I did not find the content particularly notable. 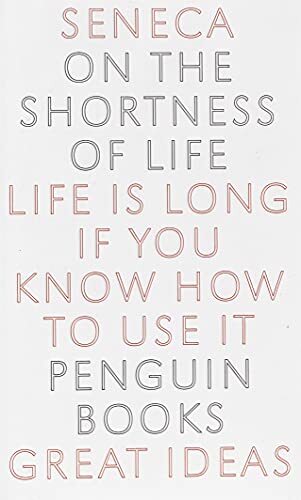 In On the Shortness of Life - a letter written to Paulinus, a friend of Seneca’s - Seneca focuses on how much time we’re given in which to live our lives and how well we do and do not make use of this time. Seneca notes that most humans complain of the “meanness of nature” because of the briefness of our lives and how we are not given enough time in which to live them. Life is long enough, and a sufficiently generous amount has been given to us for the highest achievements if it were all well invested. Men are both gripped by insatiable greed and a laborious dedication to useless tasks. Seneca notes the drunkenness and idleness of many, or those who are, through ambition, at the mercies of others. Seneca quotes an unnamed poet: It is a small part of life we really live. Seneca notes that not all of our life is spent “living”. Indeed, time not spent living is merely that: time. Certain people reveal the most stupid indignation: they complain about the pride of their superiors because they did not have time to give them an audience when they wanted one. But can anyone dare to complain about another’s pride when he himself never has time for himself? You act like mortals in all that you fear, and like immortals in all that you desire. Seneca finds it bizarre that people put off leisure time until their retirement and notes the stupidity of devoting one’s wisdom merely to an age when one is no longer able to do business. If our lives were to be significantly longer, we would still find ever more trivialities in which to fill them. The quality of a life and the amount of “living” done are not dependent on the years but by the actions and manner in which the time is spent. So you must not think a man has lived long because he has white hair and wrinkles: he has not lived long, just existed long. For suppose you should think that a man had had a long voyage who had been caught in a raging store as he left harbour, and carried hither and thither and driven round and round in a circle by the rage of opposing winds? He did not have a long voyage, just a long tossing about. The preoccupied find life very short. Vices have to be crushed rather than picked at. Seneca considers the “preoccupied” not to just be busy bodies or working men, but indeed men of leisure, such as those who arrange with “anxious precision his Corinthian bronzes.” Not all leisure is truly leisure. People who get angry at the miscutting of their hair get particular scorn from Seneca. He notes that many would be more upset by this than in their own country being invaded and dryly asks: Which would not be more anxious about the elegance of his head than its safety? Of all people only those are at leisure who make time for philosophy, only those are really alive. For they not only keep a good watch over their own lifetimes, but they annex every age to theirs. Seneca notes that you could have as your closest friends Zeno, Pythagoras, Democritus, Aristotle, and Theophrastus, and none of these will be too busy to see you. We are in the habit of saying that it was not in our power to choose the parents who were allotted to us, that they were given to us by chance. But we can choose whose children we would like to be. [I]t is better to understand the balance sheet of one’s own life than of the corn trade. Indeed the state of all who are preoccupied is wretched, but the most wretched are those who are toiling not even at their own preoccupations but must regulate their sleep by another’s, their walk by another’s pace, and obey orders in those freest of all things, loving and hating. If such people want to know how short their lives are, let them reflect how small a portion is their own. That is the feeling of many people: their desire for their work outlasts their ability to do it. They fight against their own bodily weakness, and they regard old age as a hardship on no other grounds than that it puts them on the shelf. This book on Amazon.com or Amazon.co.uk. If I got it right, I should get a small cut if you buy a copy, so thanks in advance.